I don't normally get too attached to neighborhood characters. I don't care about the five dollar guy at all. There's a slightly pleasing familiarity in seeing the walking man, but no significant emotional attachment—all he does is walk and read. 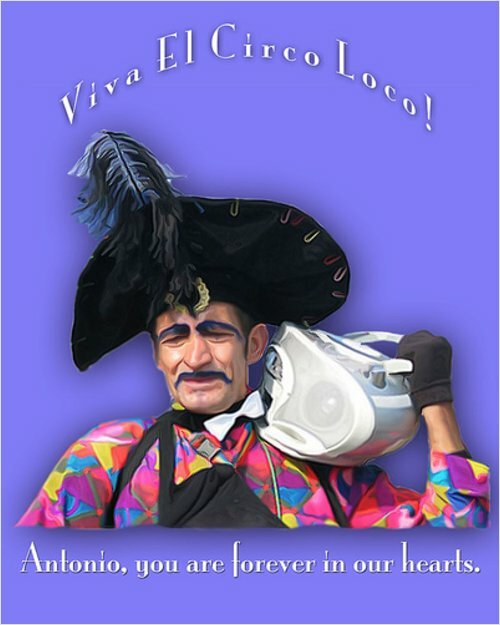 The guy everyone called El Circo Loco (whose real name Antoniz Ruiz) was somewhat different. Every time I saw him he was marching and dancing and twirling, in costume. He never just walked, I never saw him sitting, it was non-stop dancing. I supposed he was crazy, but he seemed happy, and it didn't seem completely impossible that he was just some guy who decided one day that life was short and he loved to dance, so that was all he was going to do from now on. You couldn't help but feel a fondness for him (despite the late night whistling that sometimes was annoying). Two weeks ago El Circo Loco was found dead on the sidewalk a block from my apartment. It was saddening and shocking. He seemed unstoppable. What really broke my heart was when people in the neighborhood held a memorial in his honor in a small park he often hung out in. I was at Startup School so I couldn't go, but a few days later I walked over and saw a lot of leftover glitter. They even rededicated the fountain to him (it had previously been dedicated to the inventor of the bedpan, which the fountain resembles; ah, hipsters). Bye, Antonio! I didn't realize how much I'd miss you! We just lost a neighborhood homeless character as well, here in NJ. Hit by a car. The local police station was _deluged_ with phone calls regarding the hit-and-run. A roadsize memorial the size of a king-size bed sprang up within a couple of days. It's interesting who ends up touching people's lives in surprising and unexpected ways. Se me llenaron los ojos de lagrimas, me dio escalofrió¬ ¹ una tristeza muy profunda. Pensar que la persona de la que está® hablando "Tony" era tan cercano a nosotros "primo hermano", la misma sangre que corre por nuestras venas. Lo ? que me alegra es que dejo una huella muy marcada en esta mundo y que aunque nosotros no conocimos a el Tony del que hablan en esta pagina, creo que debemos sentir mucho cariñ¯ ¹ respeto por todos aquellos que sin condició® ¬e dieron tanto cariñ¯¬ como lo demuestra esta pagina. Gracias mi gorda por compartir, estas cosas son las que le recuerdan a uno que si hay gente buena en este mundo, y que hay que vivir a plenitud todos los dí¡³ que Dios nos brinda - Yo creo que tenemos mucho que aprender de "Tony" - que en paz descanse al lado de su madre. In Beverly Hills, there's a character who wears black spandex and dances nonstop. Sometimes with roller skates. There's usually a boom box nearby and several cups of coffee. I wouldn't mind him, except he's prone to random scary yelling outbursts.